← Blink Introduce “Post Charging Occupancy Fees” in some markets – Effective July 20th 2015. Yet to be announced – 2016 LEAF spotted in the wild. There have been plenty of rumors about the 2016 LEAF and its capabilities, such as a 25% bigger battery. Nissan however have made no announcements about the 2016 LEAF, no release date, no pricing. I spotted a LEAF today that I did a double take on. The paint looked brown rather than black in the morning sunlight. Then I realized it really was brown not black. There is no brown available for 2015 LEAF’s at Nissans website. This is new I thought. Leaked information at Autobytel regarding the 2016 LEAF colors includes a new brown finish called “Forged Bronze”. The LEAF I saw was parked at Nissan HQ in Franklin TN and had Manufacturer tags on it. The Tires are not new looking so the car has been on the road for a while. There is little to distinguish this 2016 car from any other LEAF. The Michelin tires and Navigation console means it is probably an SL or SV trim. The interior was dark cloth, not leather. So this is evidence the rumors are true regarding a new LEAF model. We will have to wait until the official Nissan announcement(s) as to what we will get and at what price. 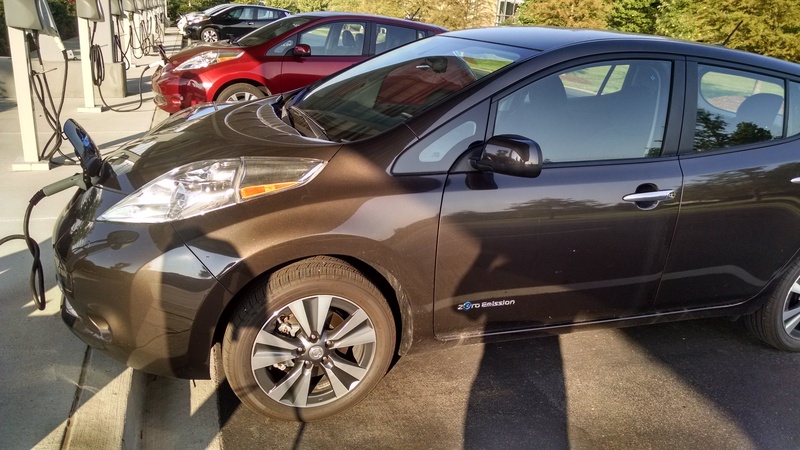 This entry was posted in Nissan LEAF and tagged 2016 LEAF, brown, forged bronze, LEAF, LEAF colors, nissan. Bookmark the permalink. 14 Responses to Yet to be announced – 2016 LEAF spotted in the wild. It could just be a paint trial with no other differences! Hi! I write a news blog, lektrisk.blogspot.com about electric vehicles, in Norway. And in this country Nissan Leaf is a very popular car. Is it okay that I download and publish your photo of the bronze Leaf in my blog? I will of course link and credit you as the source. Yes it is OK to use my Photo, just mention that it is my photo somewhere in your article. Thank You for asking. So now you can rehears your Norwegian (or use Google translate).